Fujitsu Ten's Eclipse speakers have been through a few iterations over the years, but we reckon this latest design takes some beating. The desktop speakers and amp look particularly wonderful and space-aged now, especially with that conical, UFO-like amp box in the middle. There's nothing too flash on offer here in terms of features. Like the Jamo i300 boom box, sound and build quality are the order of the day rather than frippery, though a remote control in the package would have been nice. That omission aside, everything else - from the cables that arrive already spliced and ready to strip back, to the smooth-turning volume knob at the top - just oozes luxury. This really is first-class gear. The sound quality is absolute dynamite, as you would perhaps expect from a set of desktop speakers that cost £400. It's a dynamic, punchy sound that goes loud without distorting and picks up all the details and colour in music without becoming too bright. These speakers can fill a reasonably large room with sound, but for bigger spaces you might want to add a sub-woofer and connect it using the amp's otherwise redundant 3.5mm output jack. The input and output jacks are tucked away neatly under the amp. Using the 3.5mm input jack you can bring in the signal from an iPod or Mac, or, using the twin red-and-white RCA jacks, bring in a signal from your stereo gear. 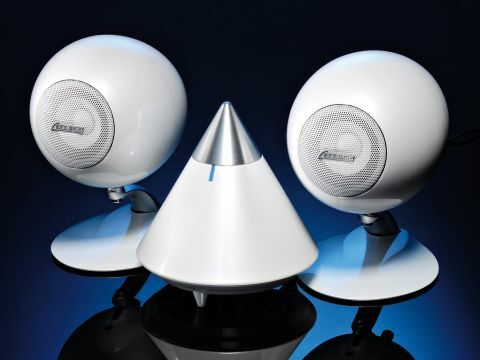 The twin speakers come with mountable bases for positioning them on walls or a ceiling; they pivot in a range of about 60 degrees, and swivel by 360 degrees. And that's about it, apart from the fact that the metal speaker guards at the front of the speakers pop out to reveal the cones. There's no gadgetry, no superfluous twinkly bits, just good quality throughout. The Jamo i300 box is a direct competitor in this price range. It also has phenomenal sound, a huge amp that doubles as a bass box, and it comes with an iPod dock and remote. However, it's also a much bigger, heavier set-up that looks out of place on a desktop. The Eclipse set-up has the advantage of looking superb on a desktop next to a Mac, particularly a white MacBook or iMac. The white finish works really well, though black or silver are available too. the purchase, we think you'll love this system. It's a perfect Mac companion.